This photo shows two teachers and nearly fifty pupils. The presence of the second teacher suggests that it was taken after 1883. The church of England school for the parish began in the incumbency of the Reverend J.C.F. Tufnell by his enterprise and not without opposition (Blaker 1919, page 75). It was given its place under the Education Act of 1870, which made elementary education compulsory; the earliest deed is dated 1874. The building is now a private house at the county boundary, on the East Sussex side*. The ground plan has not been altered. A plan drawn in 1883, when an enlargement was to be made, shows the original school to have been the front classroom, entered by the present porch, and flanked by a cloakroom on the east, and lavatory accommodation on the west side. The second classroom then planned was to be behind the older one, and was duly erected. Henceforward, it was no longer necessary to teach all ages in one room, and the appointment of a second teacher became necessary. The building lies back from the road, leaving a small playing space in front, and in 1928 additional playing space was provided when Lord Leconfield, from whom the site was held at a peppercorn rent, gave additional land adjoining for the purpose. Detail of the plaque that can be seen above the door in the photo of the school as a whole. There is now a window in that location and the plaque has been relocated. Of staff and teaching, the managers’ minutes, beginning in 1892, give the earliest surviving information. In 1902 Miss Hudson was appointed head mistress and she served the school for fifteen years. The date of her resignation, in the midst of the first world war, was unfortunate. 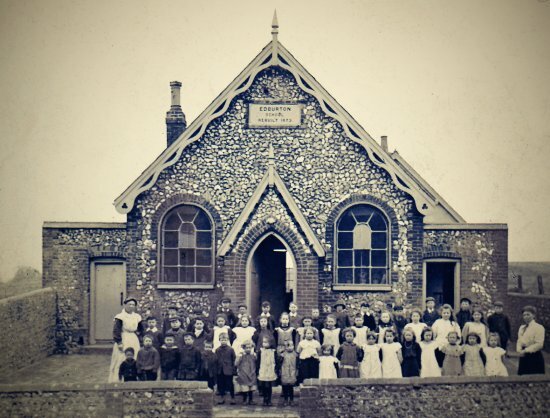 The school languished under a series of short time appointments until under Miss Aldridge, appointed in 1925, the school steadily regained ground educationally, but numbers were falling with the declining birthrate of the post-war years. There seems never to have been a time since the minute books begin, when there was not difficulty in obtaining an assistant teacher. This was partly due to housing difficulties. There was no schoolhouse for the headteacher. In the earlier years it was customary to board the assistant teacher with a villager at half-a-crown a week, but in 1892 the managers decided to add a lodging allowance to the salary and leave the assistant to find her own lodgings. They accordingly made an appointment at the munificent salary of £26 pounds a year, including a lodging allowance of £6. The school was closed in 1930, in accordance with the ‘Hadow plan’ which was being fostered by the Board (now the Ministry) of Education, by which schools were reorganised with an age break at eleven years, so that one school would consist of the younger children and a companion school or schools would receive them when they had passed their eleventh birthday. It was sometimes possible, when reorganising a group of schools in this way to eliminate a small or unsatisfactory school and so reduce public expenditure while offering better conditions for the children displaced. 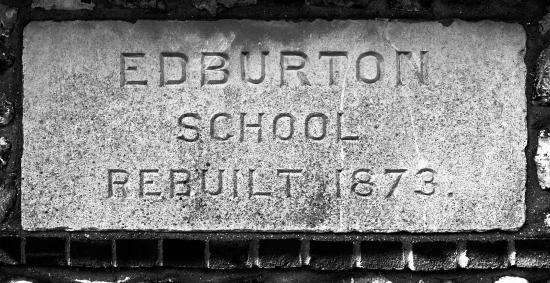 It was inevitable that Edburton school, with only 26 children, should be sacrificed. An agreement between the East and West Sussex County Councils, each of which was responsible for 13 of the children, sent the East Sussex juniors to Poynings and the seniors to Hurstpierpoint, while from the Edburton end of the parish the juniors went to Small Dole and Henfield and the seniors to Henfield. *This was true when Howe was writing in 1958. But the house is now in West Sussex as is the rest of Edburton and Fulking. N.P. Blaker (1919) Sussex in Bygone Days: Reminiscences of Nathaniel Payne Blaker. Hove: Combridges. F.A. Howe (1958) A Chronicle of Edburton and Fulking, Sussex. Crawley: Hubners. 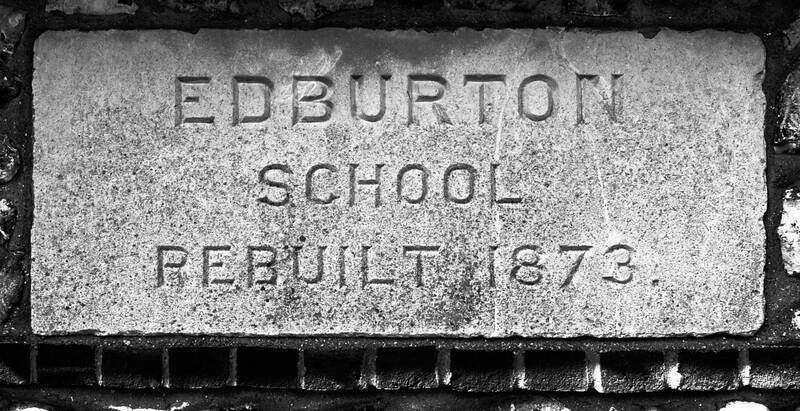 See also Edburton School II. This entry was posted in Children, Edburton, Henfield, Local History, Poynings, Small Dole, WSCC. Bookmark the permalink.